Students are required to meet the admission standards for admission to the Masters of Public Administration or Masters of Public Policy degree program. 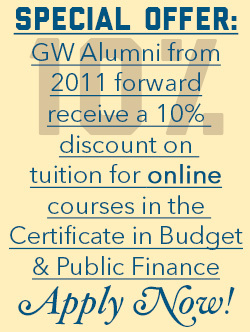 Due to credit constraints, International students requesting a student visa from GW are not eligible to apply for in-person certificate programs. If you are enrolled in a certificate program and decide to apply to the MPA or MPP degree program, you must apply by the posted deadline and meet the admissions requirements of the program. Up to 9 credits of your certificate coursework taken prior to admission to the degree program will be accepted in the master’s program within two years of completing the course and if a grade of B or better was earned in the course. If you are a certificate student who would like to apply your entire certificate coursework toward a degree (that is, all 12 credits) you need to apply and gain admission to the degree program before registering for your fourth course. Tuition is the same for all Trachtenberg School programs.